If your family is like my family try as we might, we never seem to finish all the food at Thanksgiving. However, we have no problem polishing it off over the course of the weekend. In years past we’ve dived right into Thanksgiving sandwiches the day after, but this year I wanted to add an unexpected twist. I started thinking about how yummy pesto would be with leftover turkey and then took it a few steps further to land on a delicious result – leftover bagel sandwiches! You can do this with leftover or freshly cooked cranberries, but if you decide to cook them the morning of, make sure not to leave them in the pan for too long or they will burst. Here’s hoping someone will serve this to me in bed! A girl can dream, right? I started thinking about how yummy pesto would be with leftover turkey and then took a few steps further to land a delicious result – leftover bagel sandwiches! Toast each bagel and spread the cream cheese on both sides. Combine the basil leaves, pine nuts, parmesan and garlic in a food processor and pulse. Add the olive oil a few pours at a time and pulse to combine. Add salt and pepper; scrape down the sides and pulse again. Spread the pesto on top of the cream cheese. 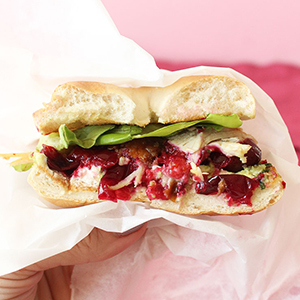 Stack the turkey, cooked cranberries, turkey pieces and a slice of butter lettuce and sandwich with the other side of the bagel. Um, why have I never even thought to try this before!? Thanksgiving at breakfast has to be one of the best ideas uh, ever. Totally saving this recipe!